The Walter Trumbauer Festival has provided quality training and performance opportunities for Alabama theatre students at the secondary level since 1940. The educational impact of this event is substantial. The festival consists of 30 individual events, a one act play festival, a studio theatre one act play festival—all for 9th through 12th grades, as well as scholarship auditions and college screening for high school seniors and junior college students. Students qualify for the state competition by earning a rating of “superior” at one of seven district festivals. At all levels of competition, students receive critiques from qualified teachers, professionals and theatre practitioners, allowing them to improve their theatrical skills. The state festival kicks off with the scholarship audition session on Thursday evening. High school seniors and junior college students compete for four $1000 ACT Scholarships. Friday and Saturday events culminate in an Awards Ceremony where trophies, plaques, medals, and other awards are presented to recognize outstanding work in technical categories and performance areas. Two one act productions are chosen to represent Alabama at the Southeastern Theatre Conference in the spring. District Trumbauer Festivals have all been scheduled for Saturday, November 2, 2019. Community Fest will also be happening that same weekend. This is an unavoidable conflict due to the availability of host venues. State Trumbauer 2019 will be held at Troy University December 5 – 7, 2019. This year our festival will coincide with the middle school band competition, so the campus will be buzzing. Make your hotel arrangements as early as possible. 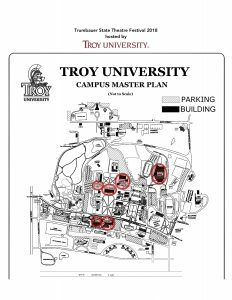 Also, please plan your One Act and Studio productions with a trip to Troy in mind. More information will become available after July 1, 2019. Congratulations to the sponsors, judges, and, most of all, students for such a successful festival. Special shoutout to our host, Troy University/Department of Theatre and Dance, for being such so well-organized, supportive, and genuinely fabulous throughout the event! For the most accurate and up-to-date festival information, download the Trumbauer State Festival app from either ITunes or Google Play for your phone and/or tablet. It’s free and will be constantly updated throughout the festival. Create a profile in the app and include your email address so we can notify you personally of any changes during the festival! Please note students who have schedule conflicts with IEs or who have been left off the list, should go to the room where their event is being held and let the judges know so they can work the student into the schedule. A full list of schedules for all events is available on the Trumbauer app and it’s updated daily. IE Schedule 2018 for SCHED_Judges: This is the schedule the judges are using! Future updates will be done on the Trumbauer App only! NOVEMBER 12:​ State Registration opens online. Tick the boxes next to the students’ names who are competing at State. SUBMIT when registration is complete. Print a copy of your invoice by clicking on the print button on the invoice page. NOVEMBER 12:​ CLICK HERE: Completed ONLINE STATE Trumbauer Judge Forms due. NOVEMBER 17:​ State registration closes online. No refunds given after registration confirmed. NOVEMBER 22:​ ​ ​State Fee Payment Due! Remember Membership Fees are only paid once. All checks/cash for fees must be received by the date of your first student’s competition, otherwise the student cannot compete. In case of emergency, notify the Director of Festivals or Festival Chair IN WRITING prior to Nov. 21. Playwriting Deadlines​:​ Playwriting entries must be sent electronically to the District Chair two weeks before district competition. Playwriting entries for State must be sent electronically by Google Docs to the Secondary Chair by the second Friday after the District Competition. Additional state festival information will be posted as it is confirmed. NOTE: The deadline for State ACT Scholarship applications is Nov. 1. The deadline noted in the Trumbauer 2018 manual is incorrect! State Schedule: The State Festival will be held Nov. 29 (Scholarship Auditions), Nov. 30 and Dec. 1 at Troy University, Troy, Alabama. District REGISTRATION: Opens Sept. 1, 2018 and CLOSES AT 11:59 P.M. OCTOBER 1.